Bento for Kidlet: Yum-Yum Bento Box Review! 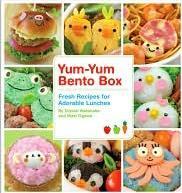 I was recently given the opportunity to review the new book Yum-Yum Bento Box: Fresh Recipes for Adorable Lunches . I have always been a fan of Crystal Watanabe and Maki Ogawa 's work but I must say this bento cookbook exceeded my expectations! Whether you are a bento novice or a seasoned pro, there is something for everyone in this 141 page bento lunch cookbook. I particularly enjoyed the photo walkthrough of some bento supplies in the beginning of the book. The Author's have used a variety of ingredients and methods throughout the book, ensuring that there will be something for everyone regardless of taste preferences or abilities! I found all of the instructions to be clear and easy to follow. For everything from smiling rice frogs to a simple summertime sandwich bento, Yum-Yum Bento Box: Fresh Recipes for Adorable Lunches is an excellent resource for fun bento ideas and inspiration! I have really enjoyed reading this book and look forward to trying my hand at some new skills!